One of the most frequent questions as a blogger is: What am I going to write about today? What story can I tell? And sometimes when you have an idea for a post, you think: That is the same type of story I told the last couple of posts. There must be other types of stories I can use. What blog stories did I not overuse already? That is a problem many bloggers face. When you have a favorite blog you probably have already figured out what is the favorite type of blog story this blogger likes to use. Often the reasons why one type of story is chosen over and over again has the simple reason that they work with the audience and the blogger feels comfortable with creating them. Download 14 Recipes to Drive Traffic to a New Blog. Click Here. 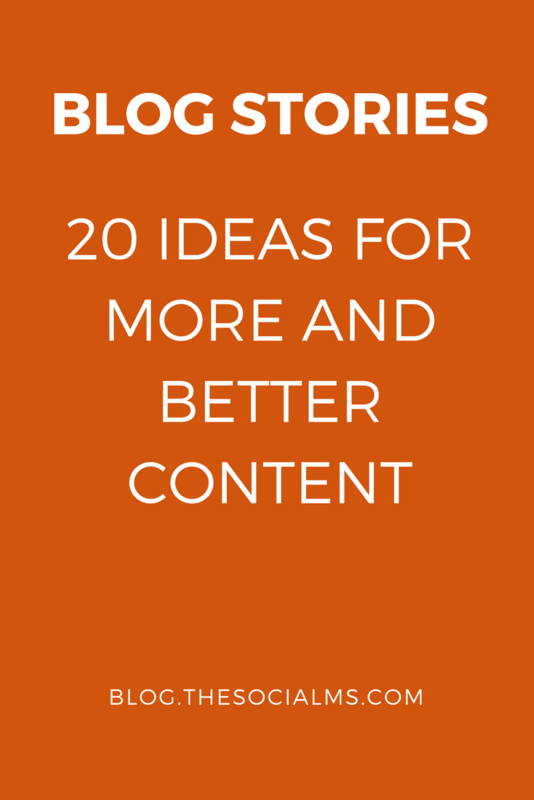 But sometimes it is a simple lack of ideas for other types of blog stories you can use. To change that, I have compiled a list of ideas for types of stories you can use on your blog to have a little more variety in your posts. This is a very common type of post for the simple reason that a title like “x reasons why…” or “20 things to do…” usually works well in social media. A list post provides a natural structuring, that allows the reader instantly to identify the parts of the post that might interest him/her. The downside of list posts is, that they often do not provide much new information but are actually fairly superficially curated posts. Tell how you found a solution to a problem, many others are probably facing. When we use this type of story the post usually runs well, because it is a unique and helpful story. We did this for our startup exploreB2B for a while and it was great: It is a friendly way of getting on the radar of influential people without begging them for a favor. Instead you honor them by asking for an interview. Our response rate was really good – and the interviews turned out very interesting. (Unfortunately they went down, when exploreB2B went down). If you interviewed a couple of influencers on the same topic, you can actually repurpose the answers and compile an overview of expert opinions on one topic. Let others benefit from your own experience. 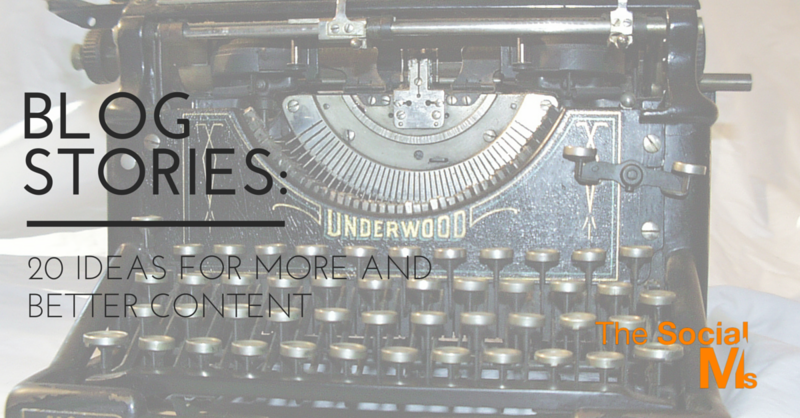 Write about the key takeaways, what you liked – and even what you hated. Often when someone else covers a topic, I think, I could have added something to the article, or I think the author is totally wrong. If you have your own take on an already covered subject, you can write an answer on your own blog. Make sure to comment on the original piece and link to your answer. Someone published a report? Hopefully with some cool statistics and graphics? Why not write and personal analysis of the report? Many blog have a recurring short piece of information. We use something like this on our Facebook page with a Social Media tip of the day. A cooking blog could have the “Monday Cupcake Love” recipe. Or a simple motivational saying. Firepole Marketing has the Firepole Funnies: A small comic that makes readers smile. Be creative, but make sure, you are not simply stealing other peoples’ funny stuff. Are you using some tools other might be interested in, too? Why not give them all your insights into the tool – they are likely to be facing the same challenges you faced and would love to see your explanations. Are you talking to a lot of people from your niche and they all ask you the same questions? Why not compile your answers into a post? Most audiences like to get a glimpse at the people they are following or reading. A small insight into who you are and what you are working on when you are not blogging, will help you build trust and connections. I have seen quite a lot of bloggers do this in form of a collection of links to great content from the past week – or month. Since you probably have many blogs you are following, you probably have tons of great content you could share – your audience will be thankful for the added resources. This either comes in form of quotes by famous people, or you can try to compile quotes from experts from your niche and comment on them. Or go back to #3 and interview the experts yourself. If you already covered one topic in several posts and to get the full picture your readers would be happy to instantly find all your posts: Make a short summary and list all related articles with a small introduction to the content. We can all do with a little inspiration once in a while. Maybe you simply want to share, where you can find new inspiration? Or who inspires you most? Why not compare different solutions for one problem? Or even your product to your competitor’s product (never lie, be honest about this – otherwise you can lose a lot of trust with your audience). Share some tips about a product you guess not everybody of your audience might know about? Or a solution to a problem, which is a little creative? This kind of post could solve some of your “what should I write” problems. If you have something like “This week in the xy industry” and simply collect the most important updates and news from your niche in a post, it will save you a lot of brainstorming on new topics to write about. I hope you found some new ideas on what to tell on your blog next time you are running out of ideas. The best advice I can give about “idea block” is to keep your eye, ears, and mind open to what is going on around you. And never confine yourself to a quiet room with no personal contact with other people. The interaction with your fellow entrepreneurs is the best source for new blog post ideas you will ever find. Do you want to start your own blog? Or did you just recently start a blog? Do you need some help with setting everything up the best way, considering all there is to do and asking the right questions? We help you to find your way through the blogging jungle and get everything right on track to success. 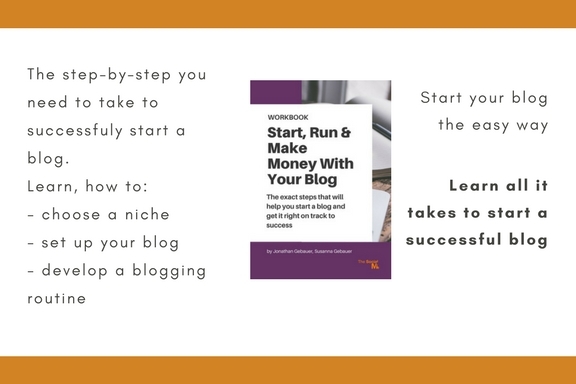 This workbook “Start, Run, And Make Money With Your Blog” will give you a head start on your blogging journey! And if you liked this article: Please pin it!